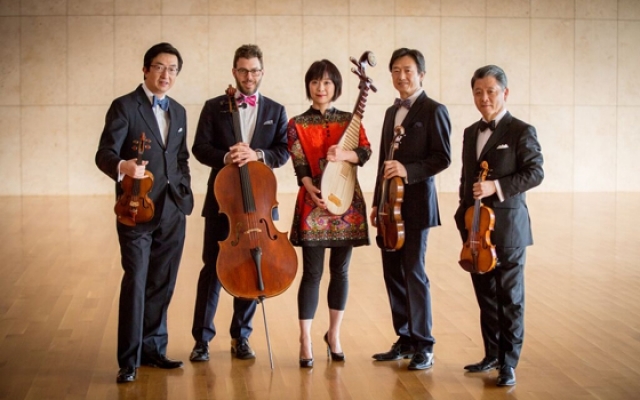 The Shanghai Quartet is an internationally acclaimed chamber group which bridges the sensibilities of East and West. Focusing in their program on folk music, you could close your eyes and sometimes imagine Ferde Grofé and Aaron Copland. Bach crops up as a reference. Yet the sounds the quartet elicits from their instruments have a wider variety than most Western groups. There are outside the box sounds too, like the stomping of feet and the yelps from the instrumentalists. Arnold Schoenberg launched those ideas about the sound of music. They now are adopted across the globe. The Quartet's stomping of feet and yelps are ferocious. The most distinctly eastern sound came from the pipa, an instrument developed thousands of years ago. Today it sometimes has five strings and can be electronic. Wu Man, a contemporary master of the instrument, played solo for us to start the evening. In her spike red heels, red stockings and a red dress, this diminutive figure dominated the stage of the newly restored officers’ room at the Park Avenue Armory. A stage has been set in front of a marble fireplace around which pictures of officers past hang. The stage greets us, and reminds us that in our time, we want to make music, not war. Listening to the pipa, you sense in part the helden in the human voice, a bright hard edge which adds a distinctive texture to the tones emerging. Tempi are governed by the color of the tones. A curious one note is created by a hand sliding over several notes at once, You’ve never heard this note before. You feel present at the creation. 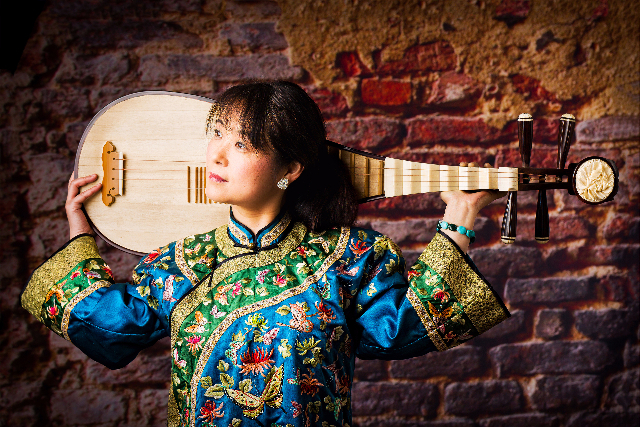 The striking tones of the pipa are made particularly clear when Wu Man joins the Quartet. There is nothing the instrumentalists do that makes their instruments sound like hers. They pluck, they do dramatic slides across the strings, and even beat their instruments. Yet they remain clearly Western instruments combined with the unusual tones of the East. Shanghai Quartet is such an inviting group. They have added cellist Nicholas Tzavaras of Spanish Harlem in New York. All the quartet members wear bow ties. Yet Tzavaras fits in with more than his tie. In the final quintet with Wu Man, he led with lines on the cello, serving as the base for portions of the piece. The affect is powerful and intense. It can also come forward as very sweet and melodic. The rhythms established strike the ear as appropriate for the tone of a phrase, and are not tied to a metronome. This makes their accomplishment as a group all the more remarkable. While the melodies are often in what sounds like a minor mode, the exuberant presentation leaves you uplifted.